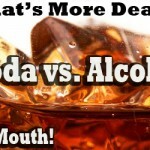 – September 5, 2012Posted in: SusieQ FitLife Breaking News, SusieQ FitLife Updates! Michelle Obama Addresses Democratic Convention with Electrifying Message! Michelle Obama is much more than her incredibly toned arms & dazzling personality! 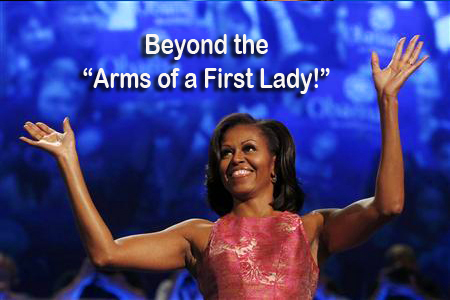 Mrs. Obama stood tall and addressed the Democratic National Convention on Sept. 4th in Charlotte, North Carolina. No matter what your political stance may be, we can all agree that our First Lady is inspiring beyond belief! She embodies confidence, strength along with compassion and love. Ms. Obama lit the stage and moved the audience last night and made us all, so very proud! The refreshing reality is that she is no different from any one else, as she states “I say all of this tonight not just as First Lady…and not just as a wife. You see, at the end of the day, my most important title is still “mom-in-chief.” We just love her to pieces! Every woman needs to be reminded that she is a First Lady and that will continue to be the mission of SusieQ FitLife to encourage this mindset in everyone! Empowerment is what we will always receive from, Michelle Obama. Our First Lady is so down to earth, graceful and relatable. Hearing all of the stories told by our humble First Lady, as she even describes the morals and values of their relentlessly hard working parents. It is easy to relate to these experiences and witness that unconditional love & sacrifice can go a long way; in the future upbringing of children and establishing core family values. Ms. Obama revealed so much last night with this statement alone, “I see how those stories – our collection of struggles and hopes and dreams – I see how that’s what drives Barack Obama every single day.” The crowd begins to chant “four more years” (reminiscent of the incredible Obama Flash Mob Harlem dance video). It is clear that our First Lady knows how to electrify an audience and captivate a crowd! It becomes very evident that Michelle Obama has had an incredible impact across the nation with organizations as a dedicated as the Facebook Fan Club: https://www.facebook.com/groups/MichelleObamaFanClub Be sure to LIKE & support! Let’s Move & Get a FitLife! PS: Watch Michelle Obama Address the Democratic Convention on Bloomberg TV (video clip above). 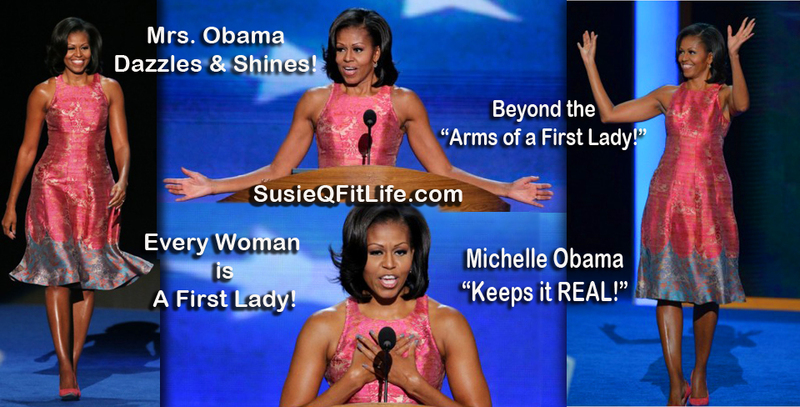 Don’t forget to “Exercise your Right to Bare Arms!” Get “Arms of a First Lady” Fitness DVD with SusieQ FitLife & Get a FitLife! Every Woman Is a First Lady! Refreshingly Michelle Obama "Keeps it Real!"